The expansion upon another person’s idea is commonplace in the modern-day video games industry. From the hardware manufacturers’ endless attempts to master another’s initial innovation, to the blockbuster game “inspiring” an endless stream of eager copycats; seemingly, there’s no good idea that cannot be improved upon. And, in some ways, Tequila Works’ Deadlight is a prime example of how to accomplish this accepted practice successfully. There’s nothing new here, but the execution is pleasingly sound. Nevertheless, the gratifying wow-factor that one gets from the initial spark of original brilliance isn’t often repeated from a clever re-imagining or refinement, and, as expected, the same holds true for Deadlight. Deadlight’s setting and subject matter has been done to the point of saturation. To the point where you’d be completely justified in feeling fed up and bored to tears with the sheer monotony of it all. Video game developers are only limited by their imagination, blessed with the omnipotent power to create living, breathing, fantastical worlds. So why oh why, do they end up following the same tattered and worn out blueprint that has eclipsed this generation? You play as the apocalyptic survivor Randall Wayne: a grizzly no nonsense male lead, with a voice that can only be described as a gruff vocal cocktail made up of one too many whiskey chasers and at least fifty cigarettes-a-day. He’s a strangely likeable bloke, even without the presence of any sort of appealing charisma. Randy felt like he’d been hung out to dry. Randy’s struggle to survive is driven by his desperate search for his lost family. 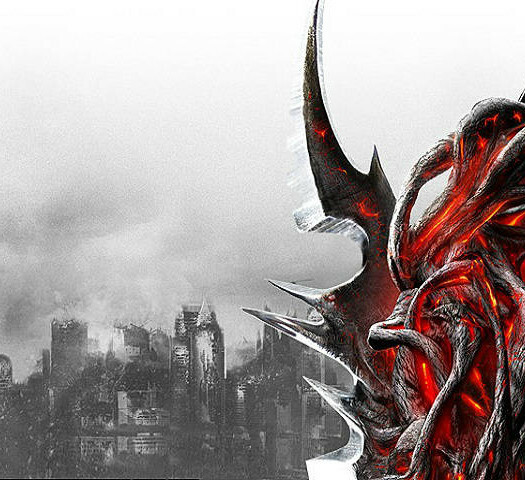 His once peaceful hometown of Seattle has become a desolate wasteland, overrun by a destructive terror known as ‘the shadows’. The game’s story is presented in a graphic novel style, providing a stark and colourful contrast to the murky, muted in-game visuals. It’s a welcomed design decision, but sadly, the story itself isn’t compelling and feels incoherent in its choppy delivery. Randall’s plight seems wholly insignificant – perhaps due to his uneasy disdain for danger – leading to a generally underwhelming narrative. Randall has a diary to view which provides a greater insight into the game’s events but it’s unlikely you’ll take the time to read every page (especially since many are missing and have to be found). Essentially, the story does the job, but it’s instantly forgettable. Naturally, as a survival game, Randall has to endure a number of hardships. He’s got clothes on his back and plenty of supplies, so what is it that plagues Randy’s selfless quest? Dangerous environments, deep waters and… the shadows. The shadows eat flesh; they infect people with their bites; they wander the world aimlessly to satiate their hunger. They are what they are. Disappointingly, these so-called shadows are nothing more than a cleverly named ruse. For you see, the shadows are not dark entities that skip along various surfaces and cascade down from behind illuminated objects. No, sadly, these ineptly named shadows are essentially everyone’s favourite flesh eating cliche: the much beloved zombie. The question as to why Tequila Works tried to poorly disguise the seemingly obvious is a strange one. The shadows eat flesh; they infect people with their bites; they wander the world aimlessly to satiate their hunger. They are what they are. Deadlight might as well embrace them. The player is encouraged to avoid confronting the shadows whenever possible. You can quickly find yourself overwhelmed by the dark beings and it’s unlikely that you’ll survive long if you’re not packing heat. Randy also has a stamina bar to contend with, so you won’t be able to dish out the damage for long periods of time: rendering you helpless against an endless horde. On occasion, Randy’s path will be blocked by the shadowy fiends. This is where the game’s taunt mechanic come in handy. Randy can whistle and holler at the shadowy masses in attempt to lure them away from his position or into an impending trap. Frustratingly, this unique mechanic is grossly underused, with only a few obvious moments requiring you to try it out. In a game filled with so many less than subtle nods to other titles, it’s a shame Tequila Works didn’t try to incorporate and expand upon this fresh gameplay mechanic more. Careful town planning often saves Randall life. Unsurprisingly, the shadows (or zombies!) soon lose their scare factor quickly. Their obvious stupidity and poor motor skills transforms them into nothing more than a tame nuisance instead of a skin-tingling fright after a couple of encounters. You’ll still have to do your best to avoid them, but you’ll never feel emotionally compelled to do so. The majority of Deadlight’s campaign will see you transversing the game’s detailed environments in the most efficient and safest way possible to avoid coming face-to-face with the shadowy masses. 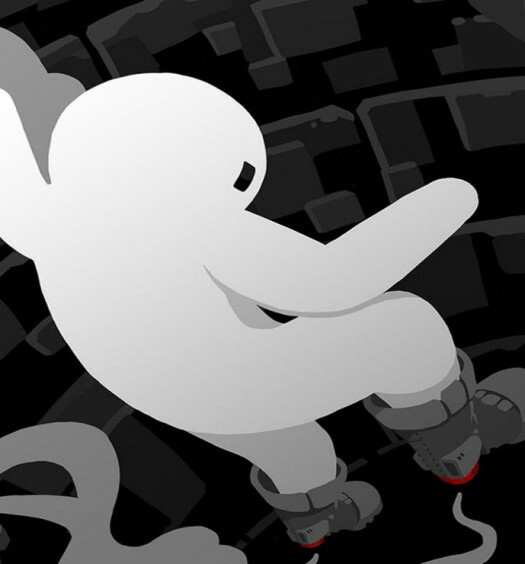 Jumping and climbing throughout the game is an effortless foray thanks to the tight controls and clever markings that highlight where you need to jump. If you fall to your death, it’s often your own fault; just the way it should be. 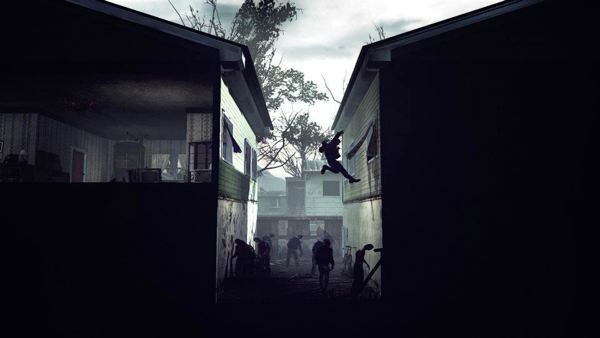 Movement is a key part of Deadlight. Randall can sprint, leap, wall jump, tackle and crouch. You’ll need to shoulder tackle weak doors, leap across perilous gaps and sprint – a lot. There’s some fantastic Canabalt-esque moments that involve Randy running for his life from a pursuing helicopter, leaping from rooftop to rooftop, crashing through windows and rolling into relative safety. Randy will also face an assortment of devious traps, bone-breaking falls and the odd puzzle to solve. Once again, a missed opportunity presents itself in the form of stupidly easy puzzles that can be solved without any real thought or challenge. And the trap placement is also rather cruel, as often, you’ll be dead before you even had a chance to react, resulting in one too many cheap deaths. Swing it wild. Swing it true. When you do find yourself staring at the red eyes of an oncoming shadow, the game’s combat system is adequate, but arguably, hit and miss. Gunplay is fulfilling, with pinpoint precision allowing you to lineup the perfect headshot; however, the hand-to-hand combat – when Randall is forced to swing his fireman’s axe in anger – feels unresponsive and tame. The fact that a shadow can only be killed by performing a finishing blow – smashing a grounded shadow with your axe – often results in a missed attempt and a frustrating realisation that the shadow is still alive and will probably kill you. 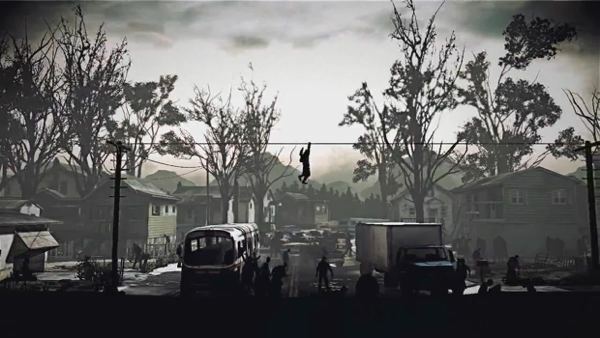 Borrowing heavily from the formulas of previously celebrated Xbox Live Arcade titles such as Limbo and Shadow Complex, there’s an immediate sense of familiarity in Deadlight’s visual presentation and core gameplay mechanics. The fact it’s a 3D side-scroller, portrayed in a striking visual style consisting of deep blacks and the occasional presence of earthy, muted colours (teasing an almost monochromatic style at points), is the most obvious comparison people will make. But let’s not take anything away from Deadlight’s impressive interpretation. The game’s quite the looker and the environmental details that transpire in the background of the 2D plane are splendid. 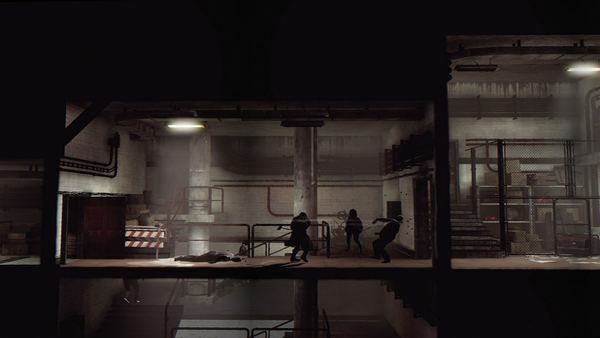 The dark and dingy lighting sets an atmospheric mood and strengthens the description: ‘cinematic platformer’. Scattered around Deadlight’s ravaged lands are secrets for Randy to find (although the term ‘secrets’ should be used loosely). Most of the time you’ll just need to wander into an obvious area and a blue cog will appear, signalling a context sensitive action. The secrets that you find can be viewed in Randall’s Memories but there’s nothing particularly exciting about them. For the achievements hunters out there, Deadlight will reward you with easy and attainable achievements as well as some unlockable avatar items. Funnily enough, the majority of the achievements are named after famous songs such as “Never gonna give you up” and “I ran (so far away)”. A nice, albeit, silly touch for gamers born in the 80’s such as myself. For the steep price point of 1200 MS points, Deadlight might leave investors feeling short changed because of the lack of any meaningful longevity. Genuine creativity may be hard to deduce throughout the game’s disappointingly short campaign – around two to three hours – but it’s difficult to argue with the end result. It’s a game which is enjoyable to play and one that manages to tread the thin line of flagrant plagiarism without feeling cheap and nasty. A review code of Deadlight was provided courtesy of Tequila Works. Deadlight is an accomplished game. It’s a culmination of tried-and-tested ideas squeezed into a brief but overall, satisfying experience. Ultimately, however, Deadlight fails to leave a lasting impression. The overly familiar premise, the lacklustre story and the unwillingness to take any real risks prevents this zombie romp from walking with the greats. Instead, Deadlight is content to reside in the shadows of their greatness.